At face value, the answer is simple. Having surpassed Erick Dampier’s all-time Mississippi State record of 249 career blocked shots this past Saturday, Jarvis Varnado is clearly more prolific at sending the ball back from where it came. Even more amazing is that Varnado needed 20 less games than Dampier to amass his current career total of 255 blocks. But totals are one thing, is Jarvis Varnado a better shot blocker than Erick Dampier? The stats point to yes. Per game statistics don’t tell the whole story as they don’t always indicate how a player performs with the minutes he is given. Dampier averaged 2.7 blocks per game for his career. So far, Varnado is swatting 3.5 per game. Part of the deeper tale is how many blocks a player is getting in his minutes on the court. For his career, Dampier averaged 28.4 minutes per game. So far, Varnado is clocking in at 21.1 per. To even the playing field, let’s compare how many blocks each player swatted per 25 minutes on the court in each of their first three years. As you can see, while Dampier remained a consistent shot blocker throughout his three-year career (a 2.36 blocks per 25 minutes average), Varnado is improving his rate. Of course, the 08-09 sample is small as Varnado has only played four games against inferior competition. However, Jarvis’ rate increased 14.5% between his freshman and sophomore years, while Dampier’s went down 4.6%. What percentage of opponent shots are blocked? If the opponent is shooting more shots, then there are more opportunities for blocks. Part of assessing the shot blocking prowess of Dampier and Varnado is looking at what percentage of opponent field-goal attempts end up being blocked by those individual players. However, it’s hard to directly compare because Varnado only averaged 13.5 minutes per game his freshman year while Dampier averaged 23.4 minutes per game in his first season at Mississippi State. I don’t have a way of measuring exactly how many shots were taken while Varnado and Dampier were on the court. I’m sure those in-depth statistics are kept by someone, but they are not available to me. So, for each respective season, I’ll adjust total opponent field goal attempts to match the ratio of each player’s average minutes to the full 40 minutes of a college basketball game. It’s an imperfect statistic, but it better compares the percentage of opponent attempts blocked when the players are averaging different amounts of minutes per game. If you want to better understand, you can check the full data here. Similar to blocks per 25 minutes, Dampier’s numbers remain relatively flat throughout his career. I won’t necessarily discuss this current year for Varnado since, as mentioned, the sample size is so small. Dampier blocked about 6% of opponent shot attempts adjusted to his time on the court (6.13% career average). Varnado, in contrast, has sent back more than one out of every 10 opponent field-goal attempts adjusted for his time on the court (10.67% career average). Blocking shots is an art. A player must have discipline and cannot go after every shot that comes his way or he’ll be spending time on the bench, unavailable to help his team. So, an obvious comparison would be to look at how many shots a player blocks against how many fouls he is committing. Both players have similar blocks-per-foul ratios for their first seasons (Dampier – 0.79, Varnado – 0.91). However, in year two, when both players averaged similar minutes per game (Dampier 28.4, Varnado – 28.5), and when both players committed 99 fouls on the season, Varnado swatted 79 more shots than Big Damp. Last year, Jarvis Varnado tied Shaquille O’Neal for most blocks by an SEC player in a season with 157, albeit O’Neal accomplished that number in four less games. 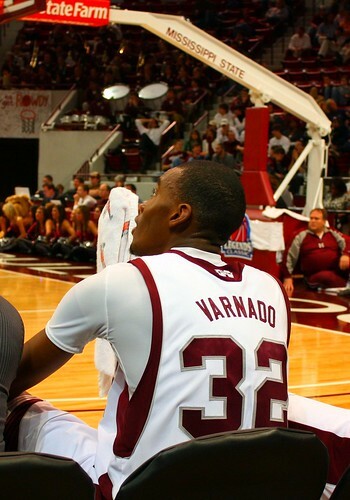 Will Varnado finish his career as the SEC’s all-time leader in shots blocked? Undoubtedly. For one, I simply cannot see Varnado jumping to the NBA after this season. If he were three inches taller, maybe. But the kid is still skinny and his offensive game has a long way to go. Of course, that’s not to say he can’t be in the league as a hustling, defending big who runs the floor like a gazelle, yet with not much offensive game to speak of. However, NBA players have the strength and know-how to avoid getting their shot blocked, so Varnado would be much better prepared for the next level with four full years of college seasoning. If Varnado repeats his sophomore block amount of 157 in each of these next two seasons (which would total 538 career blocks), he’d not only shatter the SEC career record, but would also break the NCAA Division I career shots blocked record. (The list: Wojciech Mydra, Louisiana Monroe: 1998-2002 – 535; Adonal Foyle, Colgate: 1994-97 – 492; Tim Duncan, Wake Forest: 1993-97 – 481; Alonzo Mourning, Georgetown: 1988-92 – 453; Ken Johnson, Ohio State: 1997-2001 – 444). With 19.7% of last year’s total through only four games, Varnado is well on his way to breaking more records. No, he won’t continue to face the North Alabamas and Fairleigh Dickinsons of the world, but I imagine that Varnado’s minutes, currently 24.5 per game (down 4 minutes from last year), will increase as the competition increases. Either way, don’t blink Mississippi State fans, you may be watching the best shot blocker in college basketball history, much less Mississippi State school history.